Ingham’s distribution centre in Brisbane. EARNINGS from increased poultry volumes have helped offset high feed costs in the half-year ending 29 December 2018 for Ingham’s Group Limited, Australia and New Zealand’s largest integrated poultry producer. 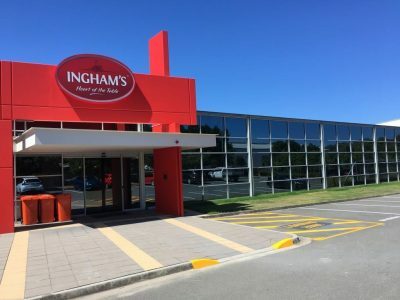 “The period has shown core poultry volumes excluding ingredients grew by 3 per cent, while gross profit increased 2.9pc to $250.2 million,” Ingham’s chief executive officer Jim Leighton said. Mr Leighton said highlights of the results were growing volumes and earnings with strong cash flow, and continued growth in core poultry volumes, with operational improvements and increased market prices helping to offset rising feed and energy costs. Looking ahead, Mr Leighton could see no easing in inputs for poultry feed. Demand for Ingham’s poultry products for the full year to 29 June 2019 is forecast to continue to grow at historical levels. Ingham’s recently opened Murray Bridge feedmill has been part of the company’s capital investment program, which Mr Leighton said was on track, expanding capacity and improving efficiency. Initiatives covering automation, labour productivity, procurement and network rationalisation were also adding to improved efficiencies. Underlying earnings before interest, taxes, depreciation and amortisation (EBITDA) increased 3.6pc from the corresponding period to $109.6m for the half year. Net profit after tax (NPAT) increased 28.5pc to $84.4m. Mr Leighton said the performance of the Australian business was strong, which offset a disappointing New Zealand performance driven mainly by the loss of some farms in early 2018 and the subsequent rebalancing of the operations. Volumes in the Australian Third-Party Feed business declined as a result of the exit of Red Lea from the industry and the sale of its horse-feed business Mitavite to Adamantem Capital for $59.5m in October. Ingham’s employs more than 8000 people, and processes 4 million birds per week. Its operations include 12 feedmills, breeder and broiler farms, 11 hatcheries, seven primary-processing plants, seven further-processing plants and nine distribution centres. Ingham’s listed on the Australian Stock Exchange in November 2016.